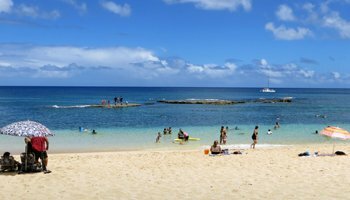 Three Tables Beach: a Snorkeling Hawaii Vacation Adventure. Snorkeling at Three Tables is Underwater Amazing! Three Tables beach got its name from the three flat “tabletops” of rock/coral barely breaking the water’s surface just off shore. 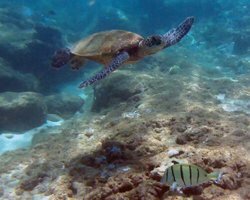 As part of the Pupukea Marine Life Conservation District, which stretches from Sharks Cove to Waimea Bay, this little cove is a world-class Hawaii snorkeling location – as long as you’re there in the summer when the wave conditions are flat. One advantage this location has over the adjacent Sharks Cove is a sandy beach. Three Tables has one, while Sharks Cove doesn't. Furthermore, it's a beautiful, wide strip of clean white sand that’s ideal for sunbathing or burying your brother. And there’s a sandy bottom extending a few meters out into the shore break for maximum water-play enjoyment. Thus, this is actually an excellent Hawaiian beach and snorkeling spot – a somewhat rare combination. 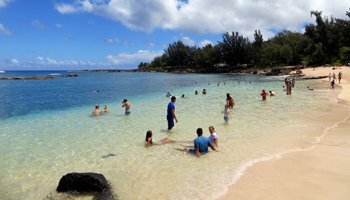 Like Sharks cove, the summertime snorkeling conditions at Three Tables are some of the best you’ll find at any of the Oahu beaches. The cove is nicely sheltered – excellent for all ages. I took my kids for the first time when they were ages nine and twelve, and they weren’t nearly the youngest children there. The water is crystal clear; and it is only one to five meters deep throughout most of the cove. The marine life is abundant and varied. During my most-recent visit, we saw schools of more than 100 fish; and we saw a couple of green sea turtles! Basically, it’s awesome. 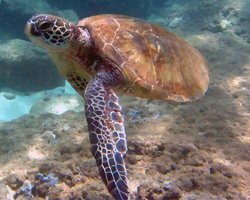 Watch green sea turtles swimming. Or click here to open a new window and watch it in HD. which I really like (link opens a new window/tab). The image quality I get for that price is worth every penny! It might be a worthwhile investment for your Hawaii vacation. Another fish we saw several of at this North Shore Oahu beach is the humuhumunukunukuapuaa. Before you freak out at the length of that word, try sounding it out. It’s actually fairly easy to say because almost all of the syllables repeat: [hoo-moo-hoo-moo-new-koo-new-koo-ah-poo-ah-ah]. See… that’s not so bad. But I’d still bet money that you can’t say it five times fast! 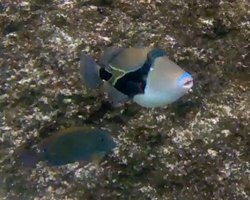 If saying it one time slowly is still giving you trouble, though, you can also call it the rectangular triggerfish (Rhinecanthus rectangulus). If that’s still too hard, just call it what the name means: fish with a snout like a pig (it even grunts like one). So what’s the big deal with this weird-looking little guy? It’s the Hawaii state fish (temporarily from 1995-2000, and permanently since 2006). 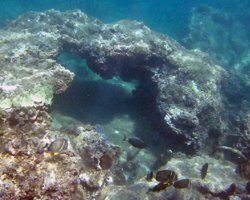 Even the variety of corals and coral formations make this location an underwater site to see! Obviously, you’ll see the tabletops. But in addition, there are coral arches and caves. There are trenches and outcroppings. One of my favorite formations looks like a pointing hand. I was looking at the pointing hand when I realized it was pointing at a turtle (see bottom of this page). That was pretty cool. Unfortunately, I forgot to take comparison/contrast photos at Three Tables last winter when the surf got big. That’s largely because I’m in the habit of not going to this beach in the winter. And you should avoid it too. Look at the winter contrast photos at Sharks Cove and Waimea Bay and you’ll understand why. 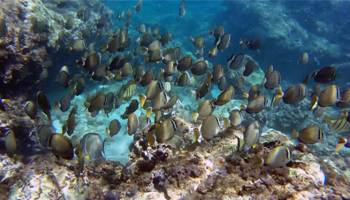 Summertime, is generally flat and calm – ideal for your snorkeling Hawaii adventure vacation! However, when the winter surf gets big, it can be brutal! Those three tabletops suddenly become three cutting boards; and you’ll be the meat, if you get in around them. Don’t do it. Getting shredded or killed is a horrible way to end your Hawaii vacation! Winter surf on the Oahu North Shore is for watching – not for tempting fate. And you’ll never see anything when the water’s that churned up anyway. There’s no lifeguard; so you’ll have to be responsible for your own safety and that of your children. Even when we were there on an absolutely calm day, we saw somebody have an exertion-related problem in the water, and the paramedics had to be called. If her relative hadn’t pulled her out of the water, things could have been much worse. There are bathrooms and showers just a short walk down the beach toward Sharks Cove. It’s not far, but it might seem like it when you’re covered in sand and carrying everything you own. There are no other conveniences; but there is a grocery store across the street if forgot to bring something. Generally, you should avoid walking on the coral. It hurts your feet; and it damages the coral, which is a living organism that’s vital to the health of the ocean ecosystem. You’ll need to bring your own snorkeling gear. Three Tables is not fully developed for tourists like Hanauma Bay – which can be good or bad depending on your perspective. Parking is just what you can find along the side of the road in front of the beach, and as such it’s limited. Most weekdays should be fine; but weekends and holidays get crowded quickly. Arrive early for best availability. There’s some shade to be had at Three Tables; but you should prepare for sun. Definitely give yourself a liberal coating of sunscreen and wear protective clothes. If you go snorkeling, remember that the mask will wipe away some of the sunscreen you’ve applied to your face. Unless you want a sunburn in the exact outline of your mask, re-apply sunscreen after you get out of the water. Three Tables is part of a marine life conservation district, so there’s no fishing or spear-fishing; and please dispose of all trash properly. Do not attempt to touch the turtle(s). It’s illegal to disrupt or harass these animals in any way. Even on a calm day, there can still be a bit of a current in the water. 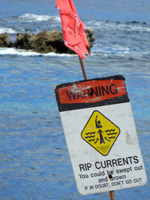 Pay attention to your surroundings so that you don’t just drift with the current out into the open ocean. Disclaimer: Stupidity and carelessness can kill you. Heed posted warning signs. Use your brain and take responsibility for your own safety. Know the limits of your ability and stay within them. Watch your children carefully at all times. Stay alive and have fun. I’m not recommending this Hawaii attraction. I’m simply giving you information about all Oahu tourism activities. The decision to experience this Hawaii adventure is your own.